At the Laney Graduate School, ethics and the responsible conduct of research are critical to student training and professional development. In fact, completion of the Jones Program in Ethics (JPE) is a graduation requirement for all LGS doctoral students. Through a competitive application process, the first recipients were announced. LGS recently caught up with these grant recipients and asked them to share their project experiences and perspectives as it relates to ethics and the responsible conduct of research. What is your funded project about? My project is looking into mental health in the aftermath of disasters, and how perceptions of justice within this environment act to alter mental health. Basically, if you have this group of already victimized people, what can we tweak in the disaster recovery process to help them recover more quickly? 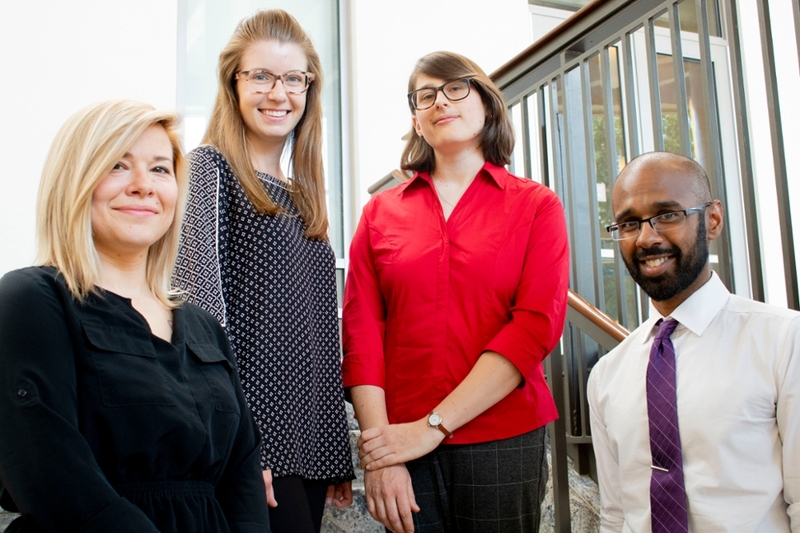 Completion of the Jones Program in Ethics is a graduate requirement for LGS doctoral students. Why is this type of programming important? Do you remember that part in Jurassic Park where Malcolm says, “your scientists were so preoccupied with whether or not they could, that they didn’t stop to think if they should.”? The Jones Program in Ethics is essentially a response to that line; it’s a formalized mechanism that ensures we consider the social outcomes of our research, not just the technical quandaries. Has JPE changed the way you think about ethics in your research and in your professional life? I’d like to think that it has. From an ethical standpoint, it’s forced me to consider how I conduct research, but from an academic (and somewhat pragmatic) perspective, it’s also forced me to reconsider what are considered relevant variables. My project examines the ethics of representation in the public health archives by turning to the photo collection of the Public Health Service at the National Archives in College Park, Maryland. I am interested in the narratives found within public health imagery and the way these narratives impact people in the real world. By turning to public health images of the past, we can begin to develop frameworks for ethically engaging with the imagery found within today's public health research, interventions, and policy. What inspired you to apply for a JPE Mini-Grant? My research rests at the intersection of public health, medicine, and literary studies. The JPE Mini-Grant provided an exciting opportunity to think broadly about ethics in cross-disciplinary research. As a graduate student in the humanities, it can be easy to engage in the theoretical side of ethics without considering applied issues. JPE helps bring students from across disciplines together to recognize ethical challenges in research, training, and post-PhD life while inviting us to discuss ways to address potential ethical issues. This type of multidisciplinary ethical engagement was essential for setting the tone of my graduate education at Emory. Absolutely! JPE has helped me see that ethical issues arise across disciplines. Likewise, the program has challenged me to think of ethics not just in terms of the theoretical/philosophical, but also in the everyday/applied. We situated our project at the intersection of Shakespeare, performance, and ethics, and we developed and brought a one-month-long Shakespeare performance curriculum to a summer camp for children facing homelessness. Our project uses the rubric of creative play and collaborative performance to create a space in which children can explore important ethical themes, develop critical thinking skills, and cultivate an empathetic imagination. As we got to know one another in the first few months of our graduate program, we realized fairly quickly that we all shared an interest in public scholarship. We believe Shakespeare is for everyone, and that his themes are universal. As academics, sharing our research with other scholars is important and rewarding, but as members of the Atlanta community, we wanted the opportunity to learn about Shakespeare alongside our neighbors. We were inspired by a number of Shakespeare-based service learning projects, especially Shakespeare Behind Bars and Feast of Crispian, and we were looking for an avenue to push our scholarship and our learning outside of the traditional academic setting and to engage directly with our Atlanta community. How were individual strengths leveraged for this project? Kelly Duquette: John’s background is in performance studies. Mary Taylor has a master’s degree in Bioethics. I taught elementary school for five years. Kelly Duquette: The JPE program has helped me realize that researchers have an ethical obligation to share their talent with members of the Emory community and beyond. The knowledge we create and the discoveries we make shouldn’t live exclusively within the academic bubble. When we share the wealth of knowledge with the local community, we strengthen it. We also learned the inverse is true. Our intellectual community is stronger when it’s inclusive of a diverse community of voices.